Bring Gotham's legendary superhero to the walls of your home using RoomMates' Dry Erase Batman Logo peel and stick Giant wall decal! 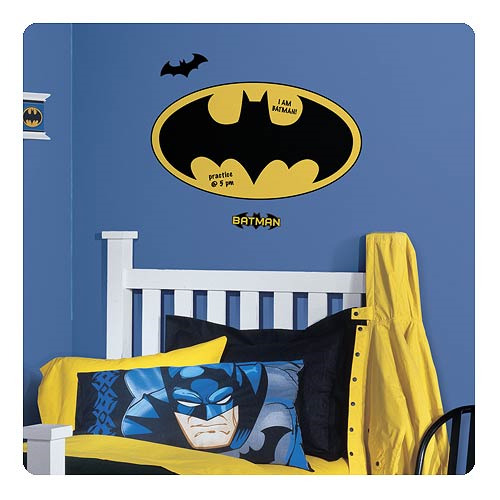 This wall decal is perfect for jotting short notes for adult Batman lovers or simply drawing for little batman lovers! The high quality peel and stick backing makes the walls decals easy to reposition or remove without any complications. Application process is easy - simply peel and stick! Comes with a total of 4 decals and measures 40-inches wide x 22-inches tall when complete. Ages 8 and up!